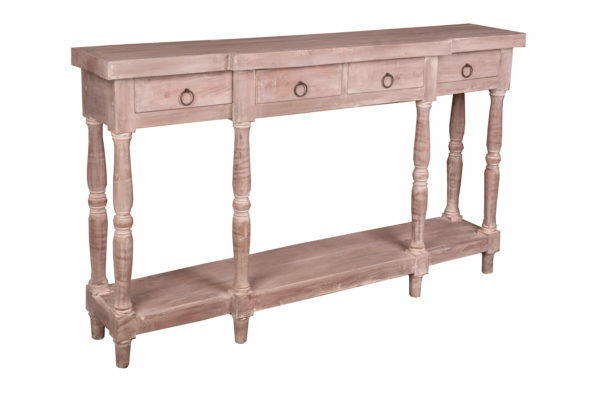 Contemporary gray washed finish combined with distinguished old world style and shabby chic charm makes this sofa console table truly exceptional. Warmth and beauty of wood paired with present-day design to update your entryway, unique finish will complement any wood, add storage and display space to match any kitchen cabinet, you cannot go wrong with this versatile piece. Using modern petite components, get rid of your bulky TV stand, modernize your living room, den or bedroom with this light and airy alternative for your flat screen TV. With drawers for your remotes, glasses and guides, it’s narrow design will enlarge the appearance of your room. Perfect for wicker or eye-catching fabric baskets on lower shelf, pile with poofs and party trays for extra seating and pizazz. Run accent lighting below the drawers to accentuate tall glass vases and artwork on bottom. WOW, this piece will make your living space shine!